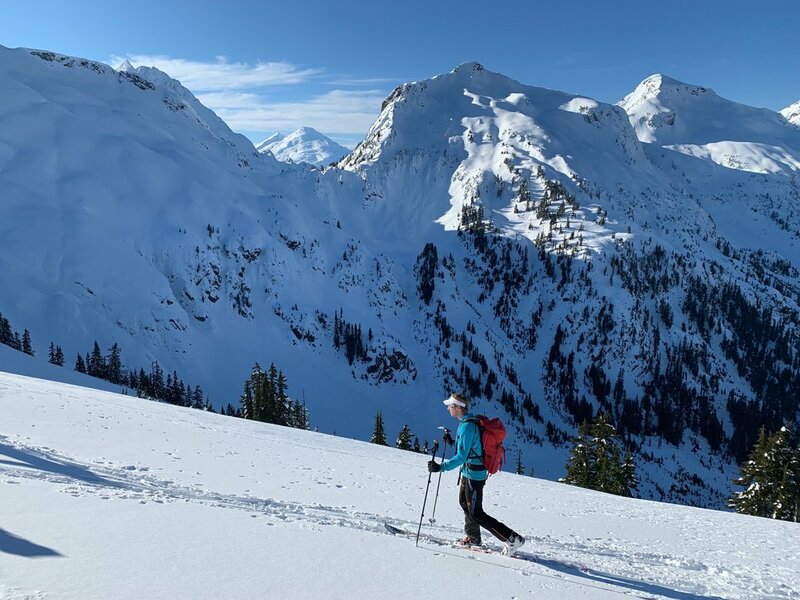 With a promising weekend forecast and a substantially-lower avalanche forecast than much of the winter so far, Kelsey and I hatched a plan to ski Ruth Mountain on Saturday as a day trip from Seattle. 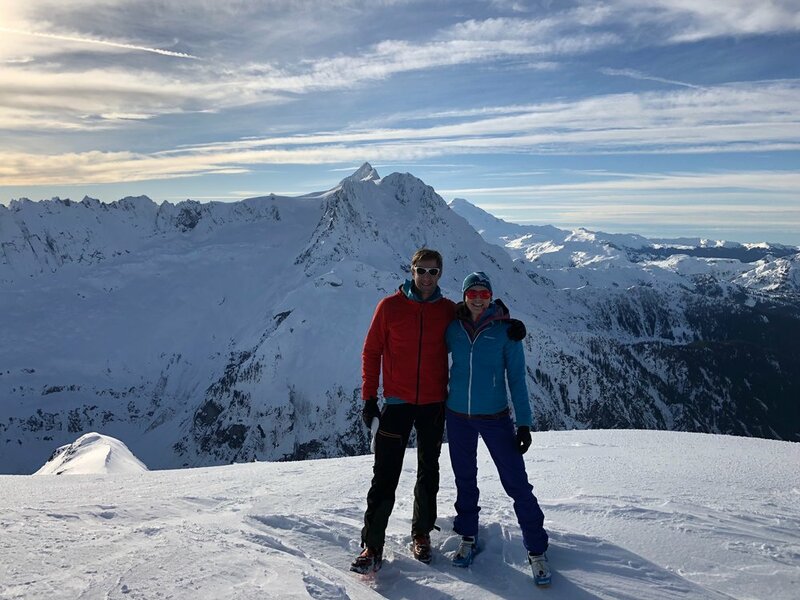 We knew the ski conditions wouldn’t be great, but the views would make up for it. We left town early and were able to drive most of the forest road, parking a little over a mile from the trailhead where the snow got too deep and a tree blocked the road. Another car of 3 guys had just parked before we rolled up and we ended up spending most of our day together. We left the car at 8:30am. About 25 minutes of skinning got us to the trailhead and then we followed the summer trail since coverage wasn’t great in the valley. Lots of old avalanche debris in the gulleys and frozen snow made the long side-hill approach a bit painstaking. It took about 2.5 hours to get to the clearing below Hannegan Pass. As we climbed, the snow finally turned from a hard icy crust to lighter, fluffier happiness. 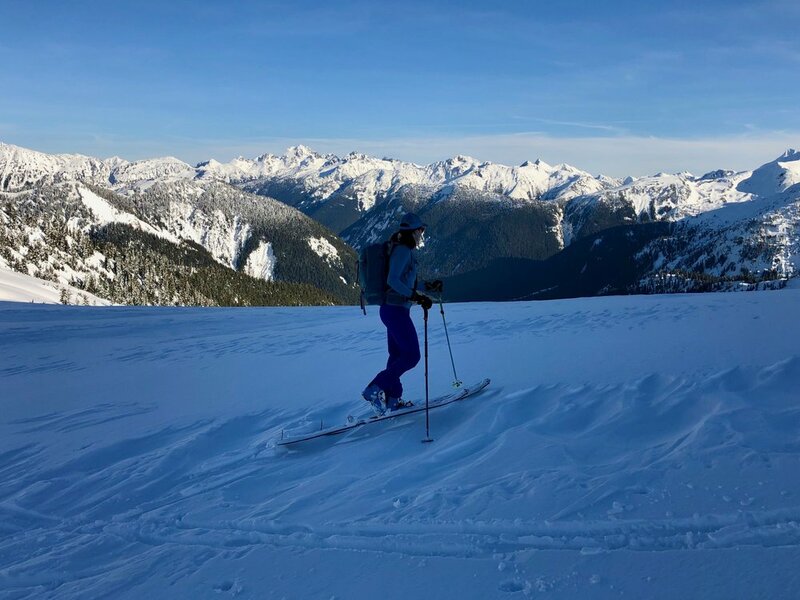 We took the shorter approach on the South side of point 5930 and started getting awesome views of Baker and Shuksan as well as The Pickets as we gained Ruth’s North Ridge. The snow became harder and the winds increased as we neared the top. We took in the views from the summit about 5.5 hours after starting our day. Being about 2pm, we didn’t linger long up top and quickly clicked into the skis to head down the north face. 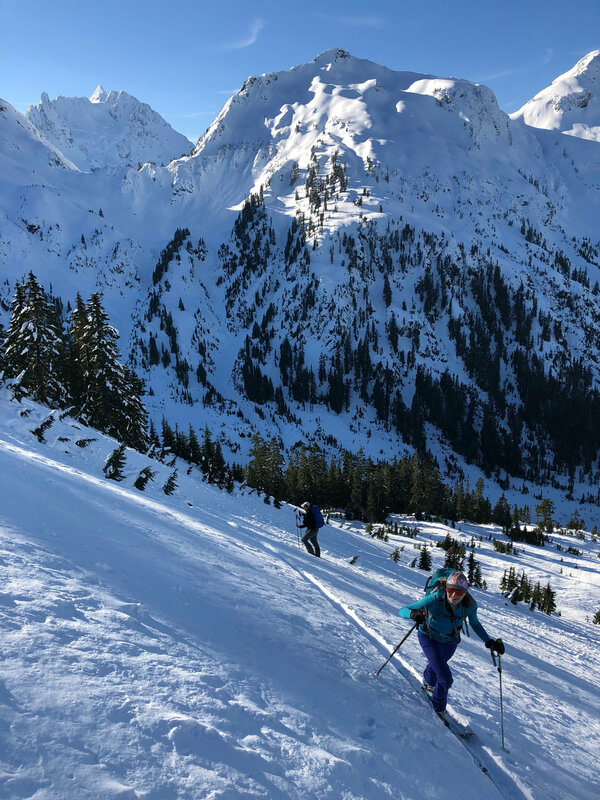 With some wind loading, we took a conservative line toward the East and finished up down the face on some fun spines to stay out of the wind loaded gulleys. We traversed the terrain lower down and slid our way across the still frozen snow in the valley, eventually putting the skins back on to get up to the summer trail and keeping them on for the rolling, frozen terrain from there on out. We got to the car right about 9 hours after starting, just before a headlamp was necessary. Fun day. A bit more horizontal and rolling travel than I was expecting. The views were stellar and the skiing up high was better than expected.